Starting around the turn of the century, socially conscious hip-hop albums were usually underground efforts. 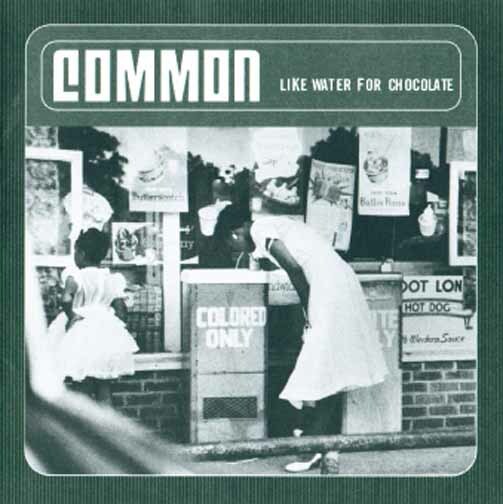 However, Common’s Like Water for Chocolate, released on major label Universal Records, is a rare exception. Notching 70,000 units sold in the first week, Common was able to achieve remarkable sales while at the same time producing an album that matched the social nature of his previous works. Proving that not all mainstream hip-hop was falling to limiting negative stereotypes, Like Water for Chocolate helped maintain an aurora to the general public. Following certain themes and motifs, Like Water for Chocolate plays out almost like a lesson-to-learn pamphlet. Musically, the album leans heavily on afrocentric themes, creative worldly sound and Common’s reoccurring spoken-word inclusions. The opening track “Time Travelin’ (A Tribute to Fela)” is an ode to the Nigerian musician Fela Kuti, who was known as a strong political activist and afrobeat staple. The song itself dances with many instruments, all while fusing African percussion, jazz and soul melodies. Produced by the founding members of the supergroup the Soulquarians (?uestlove, D’Angelo, James Poyser and J Dilla), “Time Travelin'” sets the tone for the album as a whole. Lyrically, Like Water for Chocolate is bustling with content. “Payback is a Grandmother” is a story about thieves who rob Common’s grandmother, but the end goal of the song’s message is to have strong family values and cherishing those you love. “Nag Champa (Afrodisiac for the World)” plays like a hip-hop balm as Common preaches about his ideals (“Stop eatin’ meat, lost weight, but I still rap husky/ My verse depth is that of a baby’s first step“). The first single off of the album, “The 6th Sense”, is one of Common’s best, where he not only outsmarts nearly everyone with his wordplay, but shows just how smart he is with an ironic ending skit. Produced by DJ Premier, “The 6th Sense” is a vivid portrayal of Common as a man and who he has claimed to be. “Dealing with alcoholism and afrocentricity,” he chimes, “a complex man drawn off of simplicity.” What’s so striking about “The 6th Sense” is that he wields crafty stories about himself as an individual and hip-hop as a whole, and at the end he includes an ironic skit where he totally goes against those ideals and slaps one of his prostitutes. Even more so, “The 6th Sense” is open to Common’s mistakes. He talks about how instead of criticizing mainstream hip-hop, he should be analyzing it, because the majority of the “real world” he runs into listens and enjoys the genre (“Who am I to judge one’s perspective?”). The base of these songs and their content, especially anthems like “The 6th Sense”, give us a reading on what to know and what truth to ring out. Moreover, they also beg us to learn more about ourselves and our mistakes, and what we perceive to be essential. “The 6th Sense” sees Common shifting focus from just being a snob, to an actual cultural populist, and that can ring true for all of us. Musically, Like Water for Chocolate is a tribute to the afrobeat expansion and how implying a big band of musicians and varying sounds not only make a track a worthwhile listen, but make it culturally gratifying. Like Water for Chocolate came out at the turn of the century and marked a major focus change in hip-hop. It was a socially conscious album that broke mainstream barriers, and today it can be used as an example. Mainstream hip-hop doesn’t have to be bad, but things need to be done in order for it to be so. One such way to make this happen is to allow more artistic expression and freedom on records, like Common did here. When Common Sense from the city of wind released Like Water for Chocolate in 2000, it was a time of transition in hip-hop music. As can be seen throughout history, the sounds, rhythms and content of the music was changing to reflect the social, political and economic situations of the current time period. Common’s lyrics were deep and socially conscious before this record but on Like Water for Chocolate he brings an Afrocentric perspective to the conversation that adds to his already insightful thoughts on his experiences on a local, national and global level. If you take the time to listen to his fourth studio record, the sounds you will hear are revolutionary. In understanding socially conscious hip-hop, Like Water for Chocolate is essential as it is an example of the end result of collaboration, ushered in a new age of hip-hop music and cemented Common’s status as an MC. On the first track “Time Travelin’ (A Tribute To Fela),” we are doused in the hypnotic vibe of West-African funk as Roy Hargrove, Vinia Mojica and Fela’s son, Femi, are featured. From start to finish we are introduced to and get to know the Soulquarians, the masterminds behind the production on this journey. The legendary snaps, claps and baps of Dilla make the head nod to the point of whiplash. The snare hits and deep thumps of Questlove, the tight guitar riffs of D’Angelo, the colorful notes of James Poyser on keyboard and the smooth vocals of Erykah Badu provide the perfect backdrop throughout for Common’s intelligent lyricism, creating a space where rhythm, reflection and inspiration can be found. On this album Common addresses themes such as corporate greed, ambition, misogyny, structural racism and the set-up of Assata Shakur in one power packed session, showing why on this particular record, he is on a different level. Like Water for Chocolate is a record that is worth the listen or re-listen if you’ve heard it before. From a production standpoint, it brings in some of the all-time great producers and musicians. With that, they lay the groundwork for Common to step to the mic and deliver some of the best, most inspiring rhymes you will hear on one album. Like Water for Chocolate is right there with Mos Def & Talib Kweli Are Black Star, Things Fall Apart, Let’s Get Free and Train of Thought, all albums released around the turn of the century that ushered in a new age of socially conscious and political hip-hop.